Lineage. Constituted as 459 Fighter Squadron (Two Engine) on 2 Aug 1943. Activated on 1 Sep 1943. Inactivated on 5 Nov 1945. 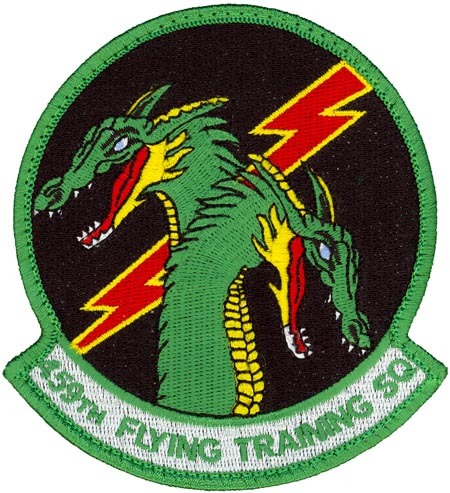 Redesignated as 459 Flying Training Squadron on 25 Feb 2009. Activated on 17 Apr 2009. Assignments. 80 Fighter Group, 1 Sep 1943; 33 Fighter Group, 12 May-5 Nov 1945. 80 Operations Group, 17 Apr 2009-. Stations. Karachi, India, 1 Sep 1943; Kurmitola, India, 5 Nov 1943; Chittagong, India, 4 Mar 1944; Rumkhapalong, India, 1 Feb 1945; Dudhkundi, India, 11 May-8 Oct 1945; Camp Kilmer, NJ, 3-5 Nov 1945. Sheppard AFB, TX, 17 Apr 2009-. Aircraft. P-38, 1943-1945. T-6, 2009-. Operations. Combat in China-Burma-India (CBI) theater, 14 Nov 1943-c. 6 May 1945. Credited with 66 aerial victory credits (AVC), 1 Dec 1943-13 Jan 1945. Awarded a Distinguished Unit Citation (DUC) for destroying 119 enemy aircraft between 11 Mar- 19 May 1944. Received a second DUC for defending an allied oil refinery at Assam, India on 27 Mar 1944. Conducted undergraduate flying training for EURO-NATO pilot candidates, Apr 2009-. Campaign Streamers. World War II: India-Burma; Central Burma. Decorations. Distinguished Unit Citations: India-Burma, 11 Mar-19 May 1944; Assam, India, 27 Mar 1944. Emblem. Approved on 13 Apr 2009.